Celebrate the tastes of Appalachia with this foodie tour of Abingdon, VA.
What is Rooted in Appalachia? There is a rich heritage of agriculture in Appalachia. The Virginiafarm to table movement is especially strong in this region. Fruits and vegetables aregrown in the fertile mountain soil and harvested with care. Exceptionally high-quality meat, poultry and dairy items are produced on family farms across the region. Craft beer and award-winning wines are made with old-world techniques. This wholesome bounty is always delivered to restaurants and farmers markets at the peak of freshness ‚Äì fresh from the farm to you. Arrive in Abingdon and check in to one of our group-friendly hotels. Head to Heartwood: Southwest Virginias Artisan Gateway for a locally sourced BBQ dinner. While you eat, enjoy watching local old-time musicians in an informal jam session. Allow time to tour Heartwoods artisan center and visit the interactive music displays. In the morning, visit Whites Mill. Tour this working water-powered mill for a glimpse of the past, then drop by the Mercantile to pick up a bag of stone-ground cornmeal or grits, as well as crafts from local artisans, and essential southern treats like a cold root beer and a Moonpie. Schedule a tasting at the Abingdon Olive Oil Company and have fun tasting dozens of different flavor combinations of olive oil and balsamic vinegar. Let your group enjoy lunch on their own in downtown Abingdon, with a complimentary dining & shopping guide provided by the Abingdon CVB. Look for the Rooted in Appalachia sign, indicating restaurants that use local products. Travel just 15 minutes away to The Harvest Table Farm and Restaurant in Meadowview, VA. Founded by authors Steven Hopp and Barbara Kingsolver (authors of the bestselling bookAnimal, Vegetable, Miracle), The Harvest Table Restaurant is radically local. All of the products at the restaurant are sourced from the farm or from over 50 regional farmers, gardeners and ranchers. 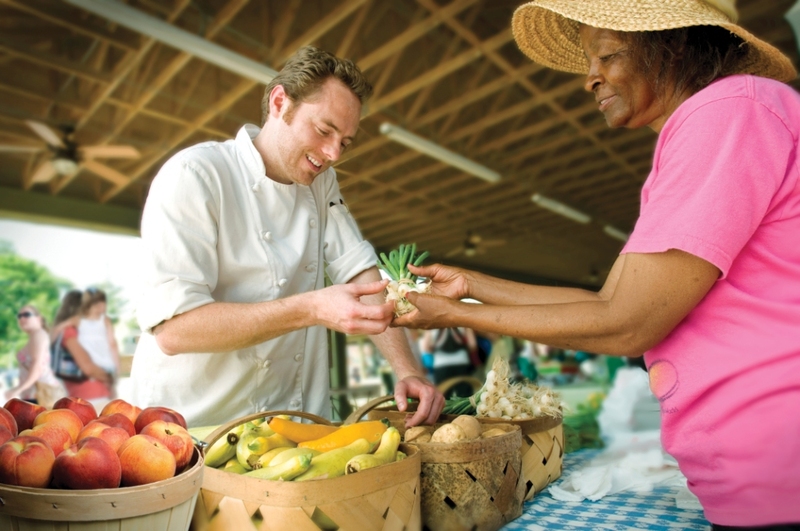 Tour the farm, then head to the restaurant and meet with the chef before enjoying dinner. After dinner, pick up a souvenir at the Meadowview Farmers Guild General Store next door. Saturday morning, have breakfast and browse the wares at the Abingdon Farmers Market. Voted the best farmers market in the region, it offers local produce, meats and eggs, but also baked goods, fresh coffee, farm products like jams and jellies, and hand-made crafts.